Respiratory products at Tim's Home Medical Supplies Inc. 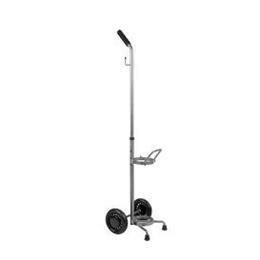 The Oxygen Tank Cart with Wheels has a height adjustable handle and is used with E- and D-Tank gas cylinders, allowing for easy oxygen use on the go. The Oxygen Tank Cart is 10" in length, 38.5" to 43" in height, and 11" wide.